Orangewire’s portable hardware-in-the-loop (HIL) solutions are based on National Instruments’ highly scalable Switch Load Signal Conditioning (SLSC) architecture. The architecture provides flexibility at the component, drawer and rack levels, allowing for the design of test equipment across the entire product development lifecycle. Orangewire’s products are cost-effective by design and allow for rapid development of simulation and test equipment for a wide range of HIL applications. Our customers have utilized our products from development to end-of-line validation and verification. External signal references (sensor, power bus, etc.) are maintained throughout the architecture. Components are interchangeable within the SLSC chassis. Components are designed for interoperability. Modularity at the component and drawer level allows highly configurable and cost optimized integrated systems. Labor is minimized during integration due to standard connectivity and cabling. IO, load, FIU and monitoring solutions are optimized for different applications. The Orangewire DET is based on the National Instruments’ 12-slot SLSC chassis. 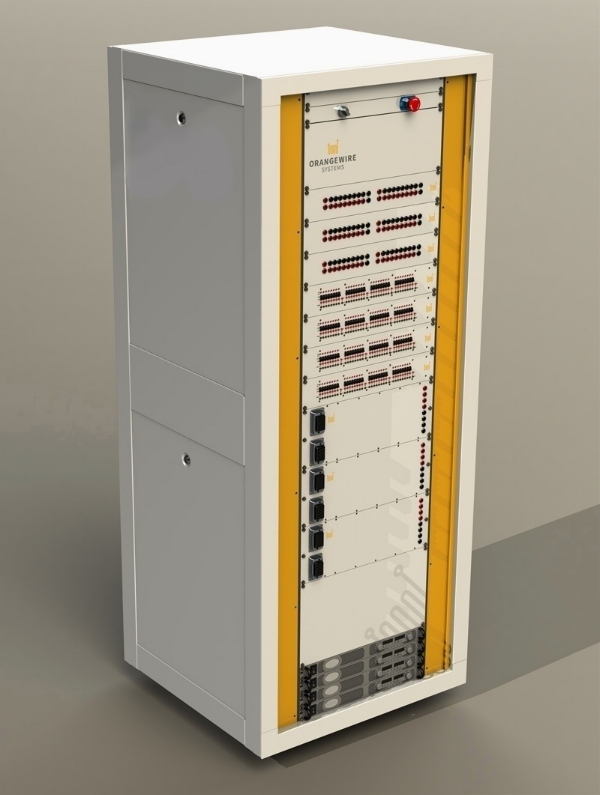 The integrated DET design provides signal and power bus continuity through the chassis, and allows for connectivity with National Instruments PXI and cRIO products from the rear. Signal and power routing is achieved through four bus lines, which are carried through the HIL backplane. The backplane additionally provides an intelligent communications bus for system control. Chassis to chassis expandability is achieved through deterministic Ethernet or reflective memory, allowing systems to scale from desktop to large integration test racks. The SLSC architecture from NI accommodates up to twelve (12) interchangeable load, signal conditioning, or failure insertion boards. The design allows optimized, application targeted chassis to be constructed from a broad catalog of SLSC compliant hardware.